It's hard to talk about Wonder Woman in a gender vacuum, as it is the first superhero blockbuster to be directed by a woman (Patty Jenkins) and the first to focus solely on a female character. But it seems increasingly impossible to talk about the movie outside of the context of gender, so I feel like I do need to acknowledge it; as a comment I read recently stated, we don't achieve equality by pretending we are already there. My social media feeds have been full of people, many of them women, talking about just how much they love the movie and how important it has been to finally see a female hero represented on screen in this way. I can never know what this is like; as a white male with the brain of a 13-year old, these kinds of movies have been aimed at me my entire life. So while I have my own mostly minor issues with Wonder Woman, some of which I will address in this review, I would prefer to keep them to myself and focus on the positive, because there's a lot of positive here. I have no interest in stepping on what feels like a real moment in popular culture, one which means so much to so many. I will say this: the movie works in the ways that many of the best superhero movies work. It also has many of the same problems of even the really good superhero movies. This, I suppose, is true equality. Gal Gadot plays Diana, Princess of Themyscira, an island of Amazon women hidden away from the rest of the world. From a young age, Diana wants to learn to be a great warrior like her aunt Antiope (Robin Wright Penn, killing it), but is forbidden to do so by her mother Queen Hippolyta (an appropriately regal Connie Nielsen). Diana trains anyway, growing up to be not just the best warrior in Themyscira, but something special thanks to her mysterious origins. 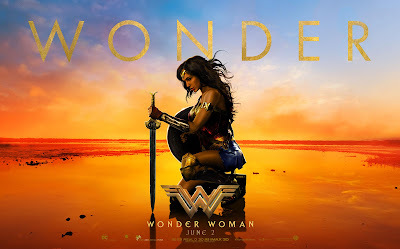 One day, an American soldier crashes into the ocean off Themyscira and is rescued by Diana moments before a battalion of German soldiers give chase, attacking the Amazons and destroying the sanctity of the island. He's Steve Trevor (Chris Pine), an American spy in WWI, who tells Diana of the tens of thousands of soldiers and innocent people dying in the war -- and the tens of thousands more who will die at the hands of Ludendorff (Danny Huston), a German soldier developing a poison designed to wipe out entire countries. Believing that the God of War Ares is responsible for making the humans fight, Diana accompanies Steve back to London to help put an end to the war. What I have often said about these increasingly ubiquitous superhero movies since the release of Sam Raimi's original Spider-Man in 2002 is that they work when the filmmakers get the characters right. Spider-Man has a great buildup because it focuses on character, then falls flat in the final third when it has to turn into a big fight scene. The same goes for the first Iron Man and Captain America: The First Avenger, which both seem to follow the same template. These are all good movies and ones that I like even though their stories eventually let them down in the last act. The very same is true of Wonder Woman, which has a pretty bad main bad guy (two, actually) and climactic fight scene, which in this case is at least offset by some really wonderful, emotional stuff happening concurrently that pays off our investment in these characters and which offers yet another demonstration of real heroism. But the bad villain fight stuff doesn't matter as much because the movie gets its title character so, so right that I would happily see another three Wonder Woman movies right now. Hear my words: when Justice League is a huge success -- and it's going to be because people like big superhero movies and they like Batman and Superman and have waited many, many years for a big team-up like this -- a big part of the reason why will be because audiences want more Wonder Woman. Were there still time to do so, I wouldn't be surprised if Warner Bros. went back and added a bunch more scenes with her. Like Tony Stark is to Marvel, Diana Prince is going to be the flagship character of this universe going forward. The DCU has struggled thus far in both embracing and defining heroism, with characters who behave in ways antithetical to traditional definitions of heroism or who reject the idea outright. Wonder Woman is practically a refutation of all of that. It is a celebration of heroism, of faith in the potential of humans to be good and to do good. In Wonder Woman, the DCU has its best and most heroic character to date. This is a film that is free of cynicism. There is no denial that evil -- true evil -- exists, which is why the choice to set the movie mostly during WWI, an actual war in which actual humans did terrible things, is such a powerful one (I say "mostly" because there are some bookends set within the present day that exist to tie movie back into the larger, previously woeful DCU; thankfully, it's all very minor and the only instance of any "world building" found in the film, which otherwise exists as a standalone story). But Patty Jenkins' movie acknowledges that evil and chooses love instead. I'm not crazy about the way she shoots a good deal of the action in the film; the green screen is too blatant, the effects work sometimes shoddy (there are moments on Themyscira that reminded me of the Burly Brawl in The Matrix Reloaded) and, worst of all, an endless reliance on speed ramping every time Wonder Woman does something incredible, which is most of the time. But Jenkins nails the most important aspect of one of these big superhero movies, which is the tone. Wonder Woman feels larger than life while still totally accessible on a human level. So many modern superhero films -- particularly those from Marvel -- are about flawed humans who must learn to be great. Wonder Woman takes the opposite approach. It's a movie that gives us a hero to whom we actually aspire to be. I literally cannot say enough good things about Gal Gadot in this role. I was unsure of how Wonder Woman would translate to the screen, because the popular perception of the character for anyone who hasn't spent much time reading the comics is that she's a pretty one-dimensional hero -- a do-gooder with a lasso and an invisible jet and little else. And, like most stupid people, I cast a sideways glance back when her casting was announced, if only because I couldn't really see her in the role and was only familiar with her as an actress from the Fast & Furious films, in which she is charming but not much else. I should have known better. 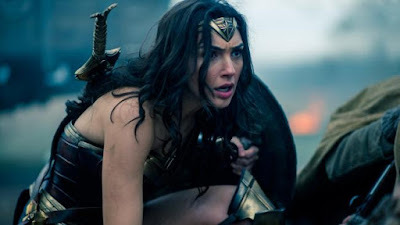 For any of my issues with some of the plotting or the visual effects or whatever, Gal Gadot has created one of my very favorite superheroes in all of cinema. Her Diana is everything you want her to be: brave, fierce, sweet, vulnerable, strong, badass, funny. She doesn't possess these qualities in varying degrees on a scene by scene basis, either; she is all these things all at once and all the time. When I think of what Gadot is able to convey in just a single look, it makes me want to immediately see Wonder Woman again. Chris Pine, playing her love interest Steve Trevor, is his dependable charismatic self but not the revelation that Gadot is. We know that Pine would have nailed it, but I'm so happy to see that Allan Heinberg's screenplay doesn't require Trevor to be a smirking, wisecracking rogue -- a guy who learns what it means to be a hero by being in the presence of Diana -- and instead makes him as brave and heroic as the title character, only lacking in her incredible abilities. He represents what is good in humans, giving Diana a reason to believe in us. She, in turn, gives him something to aspire to. She is proof that we can be better. How great is it to see a big summer movie in which the driving motivation of the relationship between the two main characters is that they inspire one another? 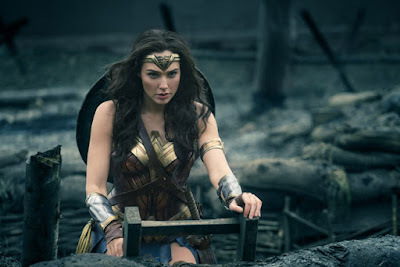 My issues with some of the narrative leaps the movie takes and not loving some of the visuals aside (which just comes down to aesthetic preference; I would argue that Wonder Womans' amazing physical feats would be even more impressive if presented in real time instead of slowing down to say "isn't this amazing? "), Wonder Woman easily joins the ranks of some of the best first outings for a superhero in the last two decades. I hate that there was so much pressure on the movie to deliver based on the gender of its character and the director calling the shots, but I'm also thrilled that the movie is playing so well to audiences of both men and women alike. I'm thrilled that I can someday show this film to my daughter, who by then will hopefully live in a world in which Wonder Woman is just one of many female heroes to have her own movie. I'm especially thrilled that we undoubtedly have more adventures to look forward to with Gal Gadot in this role, as she gives one of my favorite performances of the year. She's an incredible character inside a pretty good movie. Hopefully Mamoa can surprise everyone in Aquaman too, the best I've seen him is in "Bullet In The Head". 100% correct about their older movie star chemistry. Loved the boat ride dialogue exchange. out of fear of being spoiled i havent read beyond the first paragraph. But that is already some of the best words ive read abut the movie. Gadot did nothing for me. Thought she was the worst aspect of the movie, and just another in the long chain of catastrophically mystifying casting choices made for this franchise. The only interesting thing about any of the DC movies so far has been their schizophrenic weirdness, but now that they've decided to just give up and follow the Marvel template instead of continuing to develop their own personality, I'm pretty afraid they're not going to have much to offer going forward. wow. bold opinion. I disagree completely about Gal Gadot, with whom I was just as smitten as Patrick was, but I respect a different view that goes against the tide. Liked it a lot. Two movie stars carrying a movie with good dialogue. Couple things that reminded me of bad DC movies: shorthanding your villains to evilness by having them randomly shoot their own people. Danny Huston was terrible...he's the best you could could get to play your villain in a movie this huge? But again, quibbles because it didn't take me out of the movie much because Gal Gadot!! This is a movie that I know isn't perfect... but I also know is perfect for me. Outside of Spider-man 2, I can't think of a superhero film that I love more. I hate to be hyperbolic, but I had a weird reaction to this film. It was one of the best theatrical experiences of my entire life. I found myself tearing up every 10 minutes from pure joy and emotion. I would even say this film has the best superhero film romance I've ever seen, and it made me realize how much I miss romance being in superhero movies. It's great seeing the love interest being every bit as well developed a character as the hero. That usually doesn't happen when the love interest is a woman, but hey I'll dismount from the soapbox. I love everything about it, even the stuff that I technically know isn't great. I don't care. I loved the characters so much and I'll watch Wonder Woman fight anything. There is nothing about this reaction that I don't love. It's so great when a movie can bring feelings like this out in someone. Me too! And I love Spider Man 2 TOO!!! Great words, Patrick. There's so little I can find to complain about with this movie, which is great. The weak villain and an excessive use of speed ramping, both of which you also point out here, are the main gripes, and I particularly think the speed ramping would have been more effective if it had been in a few key spots than all over the place. But these quibbles are so inconsequential to an otherwise exciting and well realized movie in pretty much every other way that those things don't much matter. Wonder Woman is a badass and so is this movie. So excited for this - sick as a dog this weekend so didn't make it out but will very soon. Great review, Patrick, and great job addressing the gender issue because, yes, we aren't there yet folks and we still have to talk about these things. 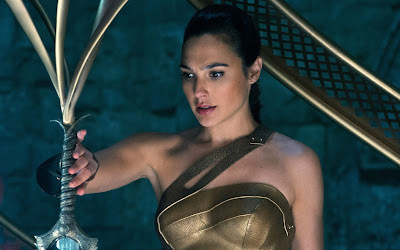 My only concern with all of the glowing reviews is that it's being graded on the DCEU Curve but even if it is, I am just happy to see something in it succeed and, based on how much I enjoyed her in BvS:DoJ, I've got a lot of faith that Gal Gadot can carry the entire DCEU on her mighty shoulders until they fully get their bearings if she has to. Great review. I enjoyed about 2/3 of the movie. I hate that DC feels like it has to end its movies with gods fighting gods and I hope that can be avoided in Justice League (although probably not). I also wasn't a fan of the twist; it reminded me too much of The Dark Knight Rises which completely crumbled under its own twist. Superhero movies and twists don't usually go well together (except The Winter Soldier and maybe Iron Man 3). This was definitely the best of the DCU movies and Gal Gadot is a star. This movie was one of those great cases where I was with it and then there's that scene in No Man's Land and I was so happy that it carries me through the rest of the film. Gadot was so good and I was really moved at the end because the actions were so much more about the characters than the choreography. Great review, yo! Just came from a sold out matinee on Harlem's Magic Johnson AMC. Loved it, the first time since "Superman: The Movie" that a DC superhero movie gave me goosebumps of the good kind. As great as Nolan's "The Dark Knight" remains, it belongs to a dark and dreary superhero universe not conductive to feeling good about the characters, their worlds and their problems. "Wonder Woman" still has the darkness and brooding from co-producer/co-writer Zach Snyder's "Man of Steel" and "BvS." Where do you think the speed-ramping scenes comes from? Sorry, but Patty Jenkins is a figurehead that ranks low in Warner's totem of creative decision makers. And yet the amount of scenes in which the lead characters backs her emotions with action and conviction for the right reasons feels fresh and new to DC. You get it a lot in Marvel movies, from which "Wonder Woman" borrows a handful of small scenes (my favorites being Diana getting ice cream at the train station) that work wonders in building our hero into a fully fleshed character. You make a good point in distinguishing between the tones of The Dark Knight, as amazing as it is in its own right, and Wonder Woman. I'm happy to have a DC movie where I walk out uplifted by a strong and wonderful character with the messages of love and hope. Without spoiling who he/she is, if you'd known who the main villain was ahead of time then Danny Huston's mad general routine would have rung hollow. We have to believe, as Diana did for most of the story, that Ludendorff is the big bad so that we're as surprised as she was when there is an even bigger one afterwards. And to the movie's credit, Ludendorff's plan (and his chemically-induced state of super strength) would have been strong-enough to be final supervillain material if the filmmakers had chosen to zag instead of zig. I think the reveal and fight would have been more dramatically effective if we'd spent more time with the person who was revealed to be the villain and if this person was more integral to Diana's emotional journey. The first Guardians movie gets criticized for having a generic and bland villain but defeating the villain at the end functions as an expression of the team facing death to truly come together. What does the character of Diana achieve by overcoming the final villain, besides being a hero who we already knew she was? What does the audience learn about her through her success? I am woman...hear my roar...and I was not jazzed with this movie. Entertained? Yes. "...important it has been to finally see a female hero represented on screen." Call me old fashioned...but I'm more of an Ellen Ripley representation...I'd rather see a strong woman like that than "the most beautiful woman in the world" constantly drooled over. OH MY GOD I LOVE THIS MOVIE!!!! That ending might actually move this into my all time favorites. The Chris Pine scenes at the end made me feel like "THIS MOVIE UNDERSTANDS", "THIS MOVIE GETS ME! ", silly as that sounds. The moment you realize he's going to help HER out by doing the right thing, by being like you put it - someone to aspire to, I cried. I also have to confess that this year I realized I like movies where the guy dies. The girl usually gets to learn some profound lesson from it then gets to move on to what she needs to do. I LIKE this scenario. I always feel like FINALLY, a guy who can help a girl out, rather than a guy who would keep you from knowing yourself just so he can keep you (and together, you just feed on each other's cowardice). Anyway, so now I get it, a lot of women die in movies helping men come to some deeper understanding, and I've railed against that. But I can see I'm so drawn to movies with this same setup and the guy is out before the end, so that it can be about the woman, ME, the viewer. A viewer isn't a couple, a viewer is one person. Now I can see how it's easier to relate to this way. Also, I kinda get teary thinking about Robin Wright these days. She's come such a long way in her career from playing Buttercup and Jenny to playing Grace on House of Cards and this woman in Wonder Woman. She's not only pretty and helpless anymore. She can be like F pretty and helpless, even though thats what made me famous, I'm not bound to that. It's kind of how I feel looking at "older" actresses nowdays who don't look like they did in their 20s anymore, they've aged, they've changed. I feel like woman, you had to care about your looks all your life, and you were gorgeous. You DESERVE to not give a F about that anymore! Have a life! I I mean it's impressive when Christie Brinkley is modeling bikinis in her 60s but...Oh my God, please let me not be body and weight obsessed into my 60s. I need a break! I enjoyed the underlying sincerity and virtue. Although I rarely watch comic superhero movies, I would definitely support future WW installments.